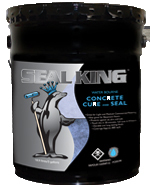 Concrete Cure and Seal | Seal King. SEAL KING’s Cure and Seal is specially formulated from acrylic polymers and fast drying solvents to cure and seal concrete, stamped or otherwise. It helps protect against oil, dirt, salt, cracking and dusting. This product has excellent water retention and color retention properties and will not inhibit the effectiveness of most floor covering adhesives for tile and carpet. Approx. 150-300 sq.ft. / 1gal. SEAL KING IS A FEDERAL TRADE MARK OF SEAL KING INC. © 2019 ALL RIGHTS RESERVED.